This publication is designed to provide Master and PhD students with a concise introduction to conducting research in organisations. It aims to impart knowledge for making the appropriate methodological choices and to provide a practical guide to research. Methodology is the ?eld which is indisputably complex. In the academic world, it is often said to be important, yet in everyday academic practice, it is not always treated accordingly. In teaching, methodology is often a mandatory course. Usually, it consists of learning how to adopt several common approaches when doing research, and how to conceive a research design (often leading to a survey). This usually leads to collecting data on a modest scale and when the opportunity arises analysing the data with the help of some statistics. Ask the students of their opinion at the end of such a course and they tend to heave a deep sigh of relief and say, I have got through it. Then their real courses start again, in which methodology often does not play a role at all. We are of the opinion that writing-off methodology in this way is a real pity. It ignores the valuable role that methodology should play in academic teaching as a whole. Here, methodology is presented as a form of thinkingand acting that, while obviously entailing research work, can also include the design and change of organisations. This broad approach has been purposefully chosen, as it is almost obvious from research and graduation projects that the students do not really have a clue what methodology involves and, therefore, wasting their time by producing work that has a little quality. 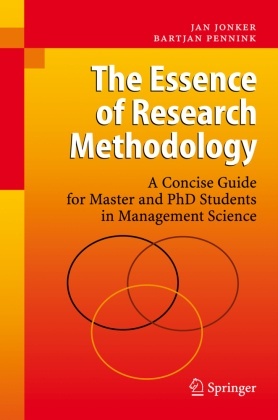 Looking at Research.- The Essence of Methodology.- Conceptual Models.- Quantitative Research.- Qualitative Research.- Assessing Your Research.- Acting and Organising.- Elaborating Your Own Research Design.- Comparative Glossary.- Epilogue.